Florida State University senior Dominique Dubon was eager to carry on her family tradition of being a Seminole. While the native of Jacksonville, Florida, followed in her older sister’s footsteps, she still created her own path on campus by crafting a college experience centered around leadership, involvement and research. Her interest in psychology led her to double major in industrial-organizational psychology and human resource management. However, Dubon soon discovered her true passion: applying psychological principles and theories in a business environment. The honor student has been highly involved in research. She was a research assistant through Directed Individual Study (DIS) Opportunity for three years in the Department of Psychology. Her time as a DIS student inspired her honors thesis research topic — how the restriction of cellphone use in an academic environment is more distracting than allowing the use of cellphones. Dubon will present her research thesis at the Florida Collegiate Honors Council Conference hosted by the FSU Honors Program this spring. Edward Hansen, a psychology professor, introduced Dubon to her passion for mental health in the workplace, and he now serves as a member of her honors thesis committee. Beyond her research, Dubon plays a vital role on campus with her involvement in student mental health. Dubon joined RENEW, a mental health advocacy and peer-education program, and serves on the executive board as of director of public relations. 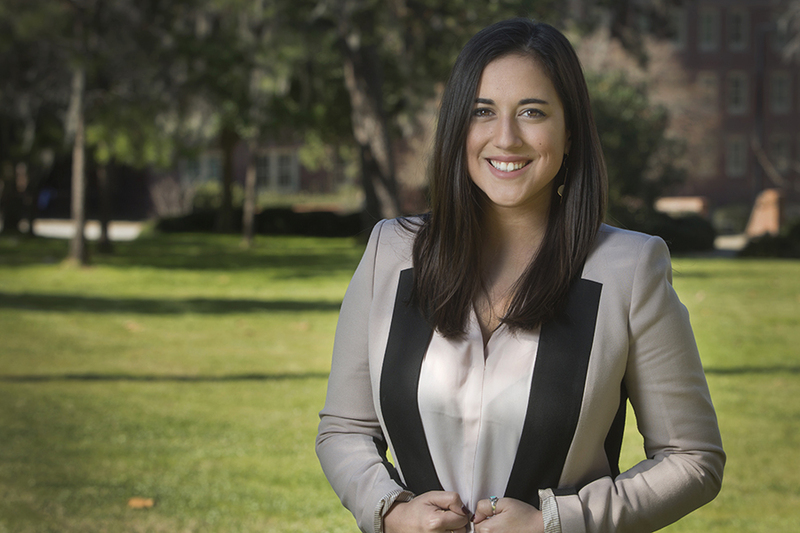 Dubon’s involvement in RENEW led to her nomination for Seminole Torchbearers, a prestigious student and alumni association of campus leaders. Through Torchbearers, she was introduced to the Center for Leadership & Social Change, where she had the opportunity to attend LeaderShape and the Women’s Leadership Institute. Both events challenge participants to lead with integrity while working toward a vision grounded in their deepest values. Dubon helped lead and mentor younger students on campus as a resident assistant and as an honors colloquium leader. She also worked at the Florida State Office of Human Resources and volunteered at Helpline 211, a suicide prevention hotline in Tallahassee, where she completed over 200 hours as a crisis counselor. “This volunteer program is such a great opportunity to get organized training in short-term crisis counseling, as well as serving a community larger than FSU,” Dubon said. Dubon is a member of the Garnet and Gold Scholar Society, a prestigious program that facilitates involvement and recognizes engaged, well-rounded undergraduate students who excel within and beyond the classroom in the areas of internship, leadership and service. “As a Garnet and Gold Scholar, I was able to build relationships in the academic community with leadership engagement and personal improvement,” Dubon said. Last summer, Dubon interned in New York City in the Enterprise Excellence Department of New York Power Authority as part of the Garnet and Gold Scholar Society. During her internship, Dubon developed a capstone project that involved creating New York Power Authority’s first Process Excellence Improvement Program for current and future interns. This project is a one-day intensive crash course to teach interns about organizational change management and process excellence. “This internship allowed me to see the tangible results of what I had been working on in school and apply it in the workplace,” Dubon said. After graduation, Dubon plans to pursue a doctoral degree in organizational development or industrial-organizational psychology, focusing on applying psychological principles and research in the workplace by analyzing workplace behaviors and change management. Dubon said FSU was an integral part of her success and creating future opportunities.